Doughnuts from the Bread Ahead bakery are famous in the delicious. office. Soft, pillowy and oozing with rich custard – now you can recreate these beauties at home using their recipe. Put all the dough ingredients, except the butter and oil, into an electric mixer (or see food team’s tips). Using the dough hook, mix on medium speed for 8 minutes or until the dough starts to come away from the bowl and forms a ball. Rest the dough for 1 minute, then mix the butter into the dough, about 25g at a time. Once it’s all incorporated, mix on high speed for 5 minutes or until the dough is glossy and elastic when pulled. Put the dough in a lightly oiled bowl. Cover with cling film and leave to rise for 3-4 hours or until doubled in size, then knead on the work surface for a minute, put back in the bowl, cover again with cling film and chill overnight until doubled in size again. If it hasn’t doubled, take it out and leave it at room temperature until sufficiently risen. Cut the dough into 10 x 50g pieces. Roll into taut balls and put on a floured baking tray, leaving room for expansion. Cover lightly with cling film and leave to prove for 4 hours or until doubled in size. Meanwhile, make the custard. Cut open the vanilla pod and scrape out the seeds. Put the pod, seeds and milk in a heavy-based pan over a medium heat, bring to the boil, then take off the heat. Mix the egg yolks and 65g sugar in a heatproof bowl, sift in the flour and mix well. Whisk the hot milk into the yolk mixture, then tip back into the pan and put back on the heat. Whisk for 5 minutes or until thick. Pass the custard through a fine sieve into a lipped baking tray, then lay cling film on top to prevent a skin forming. Leave to cool, then chill. In a large bowl, whip the cream and remaining 2 tbsp sugar until it holds its shape. Spoon the cold custard into a bowl, then fold in the whipped cream. Cover and keep chilled until needed. To fry the doughnuts, half-fill a large heavy-based pan with sunflower oil and put over a medium-high heat until it reaches 180°C on a digital thermometer. To lift each risen doughnut from the tray, slide a floured pastry scraper underneath, taking care not to deflate the dough, then lower into the oil. Cook 2-3 per batch – don’t overcrowd the pan. Fry for 2 minutes on each side or until golden. The doughnuts will puff up and float, so gently push them down with a slotted metal spoon after a minute to colour them evenly. Remove from the oil, drain on kitchen paper, then toss in caster sugar. Repeat with the rest of the doughnuts, then set aside. To fill each doughnut, make a hole in the pale band with a skewer. 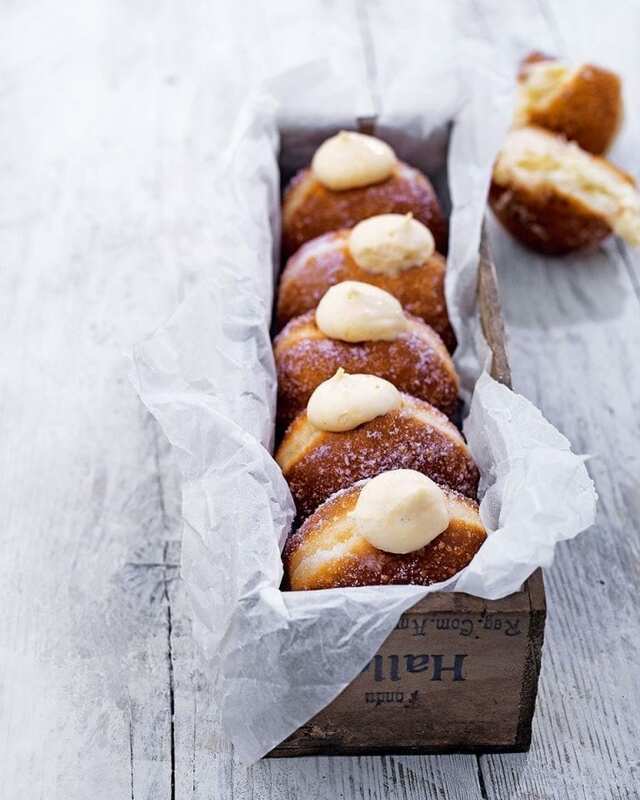 Fit a 1cm nozzle to a piping bag, fill with custard, then pipe into each doughnut until swollen. Continue until there’s a blob as wide as a 50p coin over the hole. When frying, make sure the oil is 180°C for each batch. Too high and the doughnuts will burn but be raw in the middle. Too low and they’ll absorb the oil and be greasy. To make by hand, mix in a bowl using your hands, then tip onto the work surface and use the heel of your hand to stretch and tear the dough for 8 minutes. Rest for 1 minute, then knead the dough again, adding the butter 25g at a time until it’s all incorporated, then knead for 5 minutes more. Go to step 2. After the doughnuts have been proved and are ready for the fryer, handle gently so as not to knock out the air – you’re looking for ‘pillows of joy’. The overnight cold fermentation is important to deepen the flavour of the dough and allows the delicious oils from the lemon rind to seep out. Make sure you roll the dough into smooth, tight balls for great-looking doughnuts. Would these be as good the folowing day?